All transactions are safe and secure with a reliable history in online purchasing behind each of our associates. 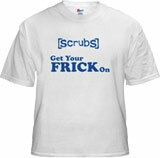 Buy the Get Your Frick On Scrubs t-shirt to own Scrubs clothing and merchandise. Frick is a word used by the Scrubs TV show characters to express immediate frustration, or it is used as a term of insult usually directed at another person. It is closely related to the more derogatory four-letter f-word, although the two are not always interchangeable. The front of this Scrubs t-shirt features the Scrubs logo with the expression, "Get Your Frick On" printed underneath it. In addition to the Get Your Frick On Scrubs tee above, browse the Scrubs Clothing Gallery for more apparel like men's and women's clothes, kids shirts or hoodies.